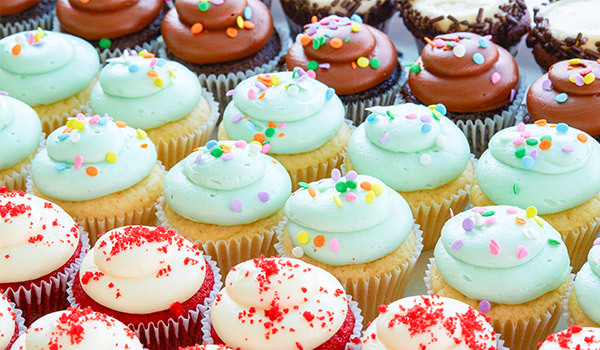 In all seriousness, we need to have an important conversation about cupcakes. I’m not joking. 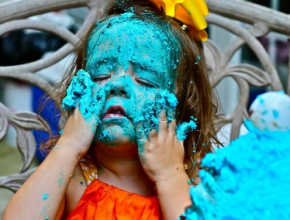 Really quick, let me take you back to the beginning of my relationship with cupcakes – when I was a young girl. Growing up, I was totally one of those kids that wanted the cupcake with the MOST sprinkles. I was certain that, the more sprinkles on the cupcake, the better the it was going to taste. I was absolutely the kid that licked every smidge of the icing off the cupcake solely to get every last sprinkle, and then threw the actual “cake” part away. As I’ve gotten older, I appreciate cupcakes in their entirety, so I’ve learned to stop wasting a perfectly good piece of cake. But as a connoisseur of cupcakes, I have a confession: sprinkles are terrible. I know! I might have just offended half of the people reading this. But hear me out. Have you ever eaten a sprinkle? It’s surprising – they’re virtually tasteless. Sprinkles, honestly, don’t add any flavor to the icing or the cupcake. They don’t have any substance. They just make it look pretty – their purpose is mostly to be decorative. They are there to appease our innate human desire to eat things that not only taste delicious, but LOOK delicious, too. When I was a little kid, the sprinkles are all that really mattered – because as children we are visually driven. Now, as an adult, I know better. However, I still like my cupcakes to look pretty AND taste good. 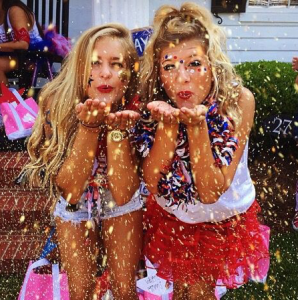 Fancy recruitment videos, balloon walls, door stacks and chants, twinkling fairy lights, glitter (lots of glitter), dreamy Instagram accounts, big houses, walls of pictures with sorority women dressed up for various chapter events, perfectly selected outfits, hair and make-up, trophies, decorations…those are what I call the “sprinkles of recruitment”. They make recruitment at lot prettier, a lot more exciting, and a lot more fun – but they don’t necessarily change who the chapter is and what they are like on a regular basis. Just like sprinkles on a cupcake – they’re merely surface-level decoration. As a professional sorority woman who travels all over the country, speaking to and working with sororities, I want to share a few secrets with you about these “sprinkles of recruitment”. Let’s start with sorority recruitment videos. Sorority recruitment videos haven’t always been “a thing” in sorority recruitment. They have only become popular in sorority recruitment within the last five years. Sorority women invest a massive amount of time, planning, coordinating, choreographing, and editing what goes into making these videos. They are carefully curated to make sure their chapter is seen as unique, fun, and ultimately draw you in. They seek to portray a narrative for you about the lifestyle their chapter can offer you as a member and that looks like something you, the PNM, would want to be a part of. Here’s the myth buster though: Every single chapter you meet during recruitment can offer you fun experiences, sisterhood, philanthropy, socials, etc. Fundamentally, every sorority on your campus, at their core, does the same things. You’ll get those experiences wherever you join. Similarly, social media, specifically Instagram, is another “sprinkle of recruitment” that sororities specifically use to draw you in and learn more about their chapter. We all know that people use social media as a platform to highlight the most idealistic portrayal of themselves. Sorority Instagram (and other social media) accounts are no different. The high quality pictures, cute Boomerangs, and fun SnapChats are intended to draw you in and highlight things about their chapter that are important to their sorority. Chapters are strategic about what they post on their accounts in order to influence your perception of them. You’re smart, we know you see that, but it’s important to understand that ALL of that is very intentionally curated to lead you to create the impression of their sorority that they want you to have before recruitment even begins. DON’T get distracted by the “sprinkles of recruitment”. 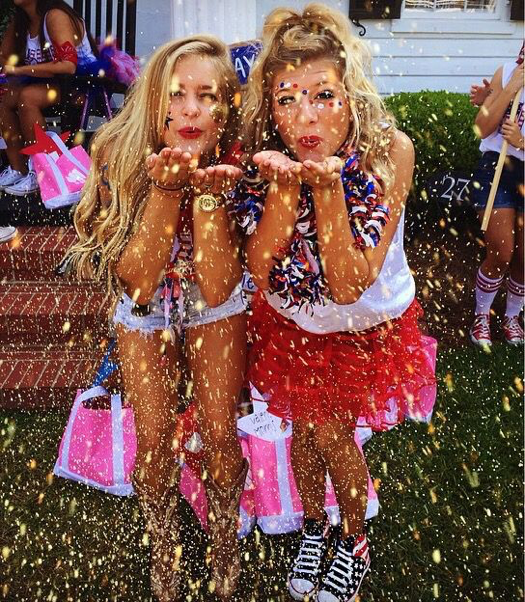 Just like a beautiful cupcake with sprinkles draws you in, sororities use sprinkles to influence you to join their chapter. The sprinkles definitely make recruitment more fun and exciting, but it’s important to understand that all of those things (outfits, videos, decorations, singing) go away after recruitment is over. After recruitment is over sorority becomes it’s real self again – without the constant entertainment, excitement, and cute outfits because those things don’t contribute to the essence of what sorority is actually about in the first place. After recruitment sorority goes back to being about the relationships, the substance – the cake, if you will. My hope for you is that you see past the sprinkles, glitter, and glitz, and instead you find women that you connect with, that become your friend in a matter of a few minutes, who want to help you grow and become a better woman, and who appreciate you for who you authentically are. These are things that actually matter in sorority, anyway. Instead of letting sororities catch your attention with sprinkles, focus on what lies beneath the “pretty stuff”. Find a chapter that has the things you are looking for when joining a group of women. Be conscious of your values and the things you want out of your sorority experience. Ask the women you meet questions relevant to what you want out of your sorority experience. Let your conversations with the women in each chapter help you to formulate your opinion. Simply, if we pick a chapter because they have the most sprinkles or the prettiest sprinkles or the most creative sprinkles… what happens next? Do you eat all the sprinkles and icing and throw the cake part away? If we do that, we are missing the best part! Focus on the chapter in its entirety. Choose a sorority with “cake” and “icing” that you love so much, after you join, you honestly can’t remember if it had “sprinkles” on it or not. Now, if you’ll excuse me, all of these cupcake references have got my sweet tooth aching. Cupcakes anyone? I’ll leave off the sprinkles! Have you heard that old song “Summertime Blues”? Aside from the nostalgia it evokes in me for the classic 1994 film, Camp Nowhere, the song also applies to how I usually felt around this time of year in college. School’s ending for the summer, the sunshine is here to stay, and it is (FINALLY) shorts weather. What’s there to be blue about, you might ask? Not to be a downer, but I remember being bummed out in the summer when all my friends scattered for a few months between semesters. Sure, summer is a great time to relax a bit, and for college students, make some extra cash at a summer job or internship. But do you ever just get bummed out that despite the great weather, you can’t enjoy it fully because all your friends aren’t living two doors down? I know I still feel that way, and I’ve been out of college for seven years! However, there’s hope to take care of your blues a bit. And I’ve learned it from my experience working with Phired Up. Over here at Phired Up (and at our sister companies, Innova and TechniPhi), the summer months are just as busy as any other time of year. We’re planning ahead for Fall recruitment season. We are hosting events for our industry partners to thank them for their time, and help provide their teams with learning opportunities to gain the tools they’ll need to see successful growth in the year ahead. Our team even gets together for a few days in June just to hang out together, recharge, and have a little fun before the craziness of August is upon us. You can model this behavior too. Here’s three ways to beat those summertime blues in the next few months as you wait eagerly to rejoin your brothers and sisters back on campus this Fall. 1) Plan. You’ve probably got some time on your hands this summer. If you’re not in class, and you’re working a part-time job, then you’re one of the lucky people who may have some free time. What a concept! Use it wisely this summer. Help your chapter or council plan for success this Fall. Use end of the year funding to pre-pay for a workshop this Fall. Call your advisor and pick their brain about ways you can be pro-active. Scan your names list and see if there are any PNMs living near you this summer you can get to know better. If you use your time strategically and wisely, you’ll be thanking yourself this Fall. 2) Learn. Even though you’re out of class, that doesn’t mean you can’t use this summer to get a little smarter. There are so many options for you this summer to keep learning and growing as a leader! There’s books, blogs, and free resources for you to check out… but I’d like to point you toward some experiences. First, contact your headquarters to learn what leadership opportunities may exist for you to attend. If they’re full this year, go next year! If your fraternity or sorority has a convention this summer, attend it! Going to my fraternity’s convention in college is one of my fondest memories as an undergraduate. If you’re not in a convention year, or if your fraternity or sorority doesn’t have leadership programs hosted this summer, don’t fret! There’s two other really, really cool opportunities for you to consider (I’m biased because I’ve been part of these before). Both UIFI and AFLV LeaderShape provide exceptional opportunities on a national level for students this summer. At the time of this posting, there’s still spots available for both! As a UIFI graduate and former intern, I’ve got nothing but great things to say about how it impacted me as a student leader… and the impact it still has on me today. Ditto for LeaderShape, which I’ve helped to both coordinate and facilitate when I worked at AFLV. There’s a reason thousands of students of the years have walked away from these programs to make a positive change on their campuses and the world. Moment of truth, people: if I could re-live any parts of college, getting the chance to go back and re-do summer leadership experiences again for the first time would be my absolute number one choice. Pro-Tip: They can get a bit pricey, so consider asking your campus administrators or national foundation if there are scholarships or funding available. 3) Play. Have some fun this summer! It’s a great time for road trips, so when you’re feeling blue and missing your friends, hop in the car and go visit them! Get your chapter or council leaders together and do a fun retreat, if for no other reason than just to spend some quality time. If you went home for the summer, hit up some friends who stayed back on campus and find a weekend to come visit. Whatever you do this summer, find a way to enjoy yourself. You’ve got a stressful few months ahead of you, so making the most of the time you have now will pay dividends when you get back to school. That’s it from me today, pals. The sun is shining, my dog needs walking, and I just found out Camp Nowhere is on HBO Go. H.A.G.S. !